If you like Big and Powerful -- this new 1/8 Scale Brushless Pro Version RC Buggy is the beast you want. The new 1/8 Scale Brushless Pro Version RC Buggy comes with factory Installed Fan Cooled 2400KV 3 Phase Brushless Motor. Connected to this powerhouse is a 100 AMP Hobbywing Waterproof Fan Cooled Brushless Electronic Speed Control and a 11.1v 3900 mah LIPO Battery. Straight out of the box this buggy goes hard leaving lesser powered buggies in its dust. This is our most powerful 1/8 Scale Electric Buggy to date, and its built tough to take it. The new Brushless Version has many familiar and new features like Coil Over Alloy Cap Oil Filled Shocks, Fully Proportional Braking, Forward, Reverse, Full Ball Bearings and Specifically Designed All Terrain Tires, Countersunk Alloy Chassis, Alloy Shock Towers, 3 Differentials, Splash Guards plus a long list of features below. Whether you are a professional racer or you just want to blow off your pals cars, the new Pro Version now comes the very latest 98% efficient Brushless Motor. Not only does this motor give the truck a whopping 30% more speed, it also screams around the track much longer due to the fact the brushless motor is 98% efficient compared to only 48% for brushed motors. The new 2.4 Radio means longer range, no crystals, no external interference and no interference from other cars. The intelligent digital radio automatically switches between different channels so you will never have a car on the same channel. Not to mention no aerials to snap on the car and transmitter. 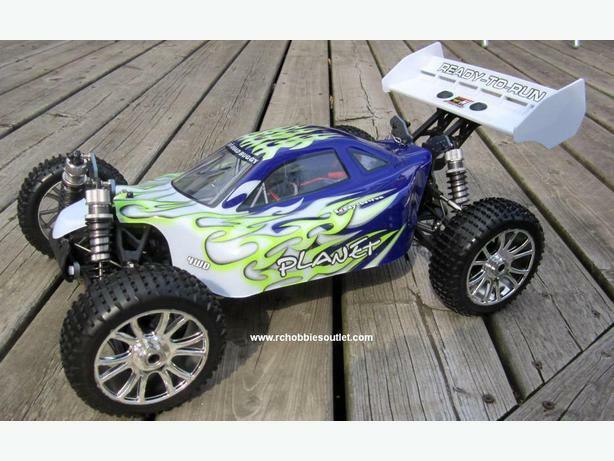 This Buggy comes 100% fully assembled straight out of the box with a 2 Channel 2.4G Radio and fully painted body. Fast low cost shipping is available to your area.